There are so many of these spray inks...plain, pearly etc., and it's amazing the different effects you get on different papers and card, but I've never been very happy with the finished product. I wanted a more blended look and decided to try blotting paper, Luminarte Radiant Rain and Perfect Pearl Mists...with pleasing results. Because it's so absorbent lots of water can be sprayed to blend the colours with out the ink rolling off the paper. I have a large piece of blotting paper underneath the sample one and I also spray it with water before the inks to flatten the paper. The blotting paper has a fabric feel to it as well. These samples feature the sprays and my new Cape Daisies Duet stamps. 1. 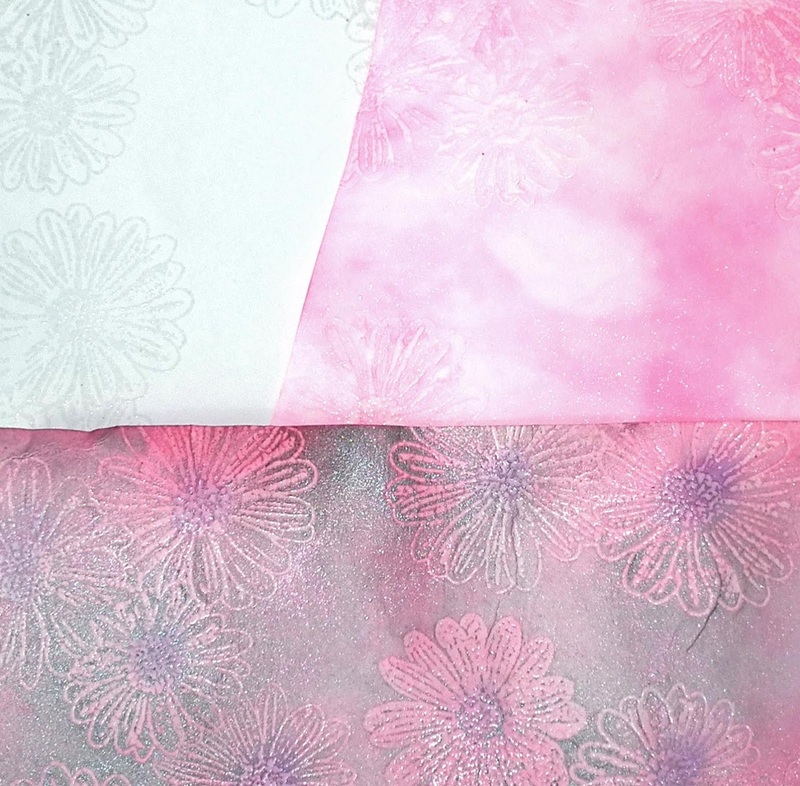 The dry blotting paer was embossed with the open Cape Daisies stamp and clear powder. 2. The paper was sprayed with water. and then dried over a radiator (which is surprisingly quick). 4. The single Cape Daisy Duet stamp (the solid one) was embossed with clear powder. 5. Pewter Shimmering Mist was sprayed in patches over the paper along with water. 6. Perfect Pearl Mist (white pearl) was then sprayed to give extra sparkle and the paper dried. dabbed with a stencil brush in the flower centres. I have some of the Luminarte and Perfect Pearl Mists in stock, please e mail me for details.